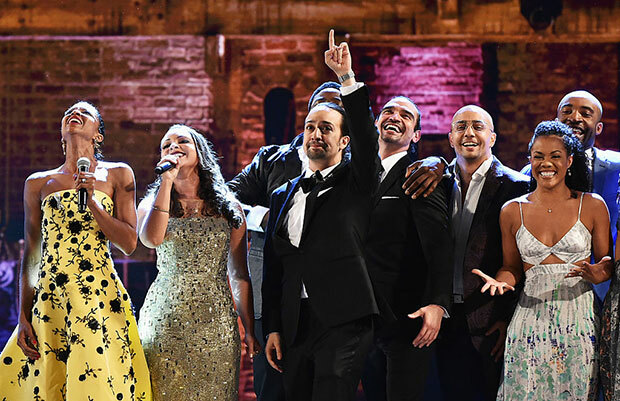 Last night’s Tony Awards were pure Broadway magic. It was one of the most joyous, loving, and supportive ceremonies we’ve witnessed in a long time. Trophies were awarded to many deserving actors and singers, but there was one show that stole the stage in particular: Hamilton. The show was nominated for a record 16 Tonys and brought home 11, including the statue for Best Musical. The entire cast and crew was on point from the moment they stepped onto the rose-studded red carpet. Here’s a snap from Alex Lacamoire, the show’s musical director and orchestrator. Leslie Odom Jr. shared a pre-show snap as well, but this one had a more solemn tone—sending love to the victims and families of the devastating shooting earlier that day in Orlando. Before the ceremony kicked off, host James Corden also paid tribute to those affected by the shooting. In fact, the entire show was dedicated to the victims of the horrific act. Corden opened the show with a sincere message to the theater community about love and acceptance—a sentiment that the rest of the nominees and winners echoed whenever possible throughout the night. After paying tribute, the show continued as normal—because the show must go on, and because in the face of tragedy, one of the best things we can do is find a reason to smile. Corden’s opening monologue was a musical one, naturally, and parodied “Alexander Hamilton,” the opening number of Hamilton. It even featured some of the cast members, in full costume! From there, Lin-Manuel Miranda appeared on the outdoor Tony’s stage and sang a song with some of theater’s finest. But he soon headed back inside, because it was time to hand out some awards. And he had a very busy night of accepting statues and cheering for his fellow cast members. The night saw many Hamilton acceptance speeches, but one stood out in particular. When Lin-Manuel Miranda accepted the award for Best Original Score, he recited an original sonnet about the importance of love in the face of tragedy. “Love is love is love is love is love is love is love is love cannot be killed or swept aside,” he recited with tears in his eyes. Renée Elise Goldsberry and Daveed Diggs proudly watched the emotional moment from backstage. During the night we were treated to not one, but two Hamilton performances. President Obama and the First Lady introduced “Yorktown (The World Turned Upside Down)” via a pre-recorded video clip, and “The Schyuler Sisters” closed out the night. Audiences were also treated to scenes from Corden’s much-loved Carpool Karaoke segment with Lin-Manuel Miranda—a video we’ll be re-watching forever and ever. We had a feeling Hamilton would take home the win for Best Musical, and when Barbra Streisand took the stage to present, we knew it for sure. The legendary singer was wearing a Hamilton-inspired suit, complete with big gold buttons and a ruffled collar. Sure enough, she confirmed our suspicions, and awarded the musical its 11th trophy of the night. Here they are—the entire cast and crew of Hamilton, taking it all in. The Hamilton fun didn’t end there. The musical’s after party had its own signature cocktail menu, inspired by its music and lyrics. It was the Hamiltonys indeed! Congratulations for everyone in the Hamilton cast and crew for your well-deserved success!